Peter King, “The Monday Morning Quarterback” ranked all of the quarterbacks in the NFL on Monday June 18th. He ranked Philip Rivers as the #8 quarterback in the NFL. He ranks ahead of Donovan McNabb (12), Brett Favre (14), Ben Roethlisberger (17), Michael Vick (21), and Daddy’s Boy Eli Manning (23). Charger fans know how good Philip Rivers is but until now most of the national media had always referred to Rivers as “managing a game” or “not losing the game.” He is a premier NFL quarterback and the Chargers are lucky to have him. One thing on the list that could be disturbing to some die-hard Bolts fans is that Drew Brees is ranked the # 3 quarterback in the NFL. The discussion about Brees or Rivers is well over and should be. The Chargers couldn’t have kept both of them and they made a solid decision in choosing Rivers. A lot fans seem to be happy seeing Drew Brees succeed with the Saints. He is a great guy and very professional. 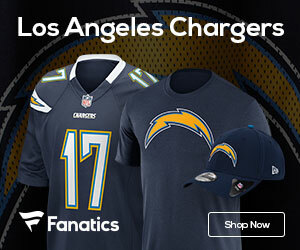 The Bottom Line: The Chargers have a great quarterback in Philip Rivers and he has the potential to be one of the best quarterbacks in the league. Especially if he can help take this team all the way.